This EA is famous (or infamous) grid strategy used by social traders. Its goal is to harvest most out of trending market (on automatic mode) taking advantage of corrections in trends. It can be also used by experienced traders on manual trading. This kind of system is being used by most successful social traders having 500+ paid subscribers. Combine your trading experience with this automatic strategy! 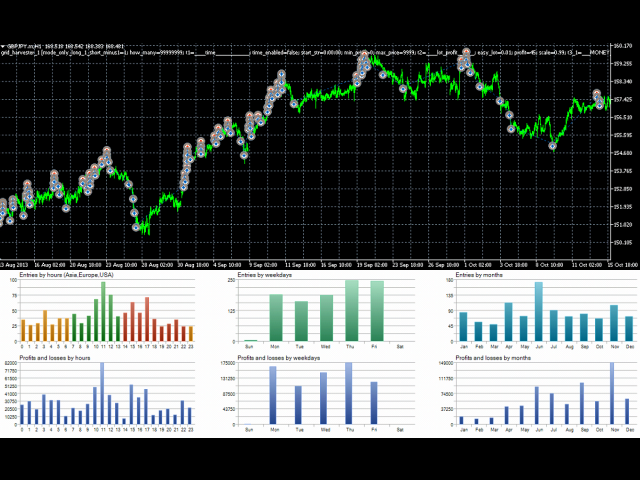 It contains grid for GBPJPY that is easily scalable on other currencies. Test it on GBPJPY 06.2012 - 11.2013 at any timeframe (every tick). For open prices only, you should use M1 timeframe. Other pairs: CHFJPY, EURJPY, CADJPY, USDJPY. Can be also tested on any other currency pair with a trending market (for example, GBPUSD 06.2013-11.2013) or oscillating market. The Expert Advisor is very easy to configure. Send me private messages for more details or watch the MetaTrader 4 version video tutorial. Of course, a backtest cannot tell you everything you need. For example, GBPUSD is now changing direction to a downward trend (at ~1.64000 on 02.12.2013). It's a good opportunity to use the grid strategy to benefit from that fall. Test previous up and down trends to adjust the best grid for this pair. You need to use a little brain to have results with this strategy, not just run it wild. Or "run it wild" only when you think the up/down trend is going to continue. JPY pairs are good for automated trading as Japan is facing default and inflating its currency (yet it does not guarantee success). 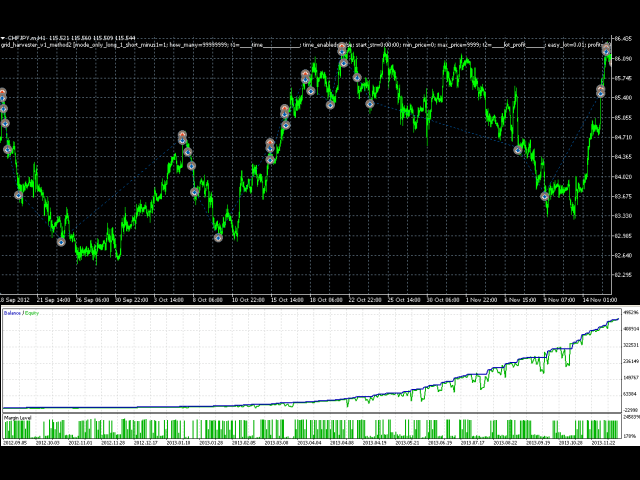 The strategy has both MetaTrader 4 and MetaTrader 5 versions. Great functions and a huge set of customisation . Swift and professional service from the author. I asked him for a fix and he did it in 5 minutes since i messaged him. Very very pleased. Count me in for any new product. На тестовом реальном счете с 16 по 26 декабря на настройках по умолчанию заработал 100% от депо, просадка была 22%. Так как это сеточник, большую опасность предоставляют просадки, поэтому совет - учитесь и не жадничайте! Поторгуйте сперва на демо или лучше реале центовом, потом уже пробуйте заработать прибыль. Система полуавтоматическая, в обзоре про это не написано. В момент запуска советника открывается сразу позиция или на покупку или продажу (в зависимости от настроек) и поэтому первый же вход может быть неудачным. У меня все обошлось, но не факт что так же повторится. Это инструмент, с которым надо уметь обращаться. Из за языкового барьера, довольно трудно было общаться с разработчиком, но тем не менее почти на все вопросы получил ответ. Зачастую друг друга просто не понимали, поэтому очень нужна инструкция по работе, в том числе на русском языке. Советник перспективный, рекомендую к покупке. В будущем много полезных функций, упрощающих работу с советником. При грамотном подходе и разумном ММ уверен будет приносить хорошую прибыль. - added graphical panel to support automatic trades. - added YourAI FREE basic decision module. Now you can use external indicators as filters or signal source. For full YourAI module check PRO version. - Added possibility of using only buy or sell mode alone with oscillation mode. WARNING: Removed the alpha automated module - do not update if you were using that option or contact me. Old v3.x config files are compatible (reset to defaults before loading old config) but if you were using oscillation option, you need to enable it in "Manual/Automated Mode". Contact me if you have any doubts. Fixed a bug with money management. - Fixed trailing step with oscillation mode on distance-to-MA closure. - Fixed PIPS SL graphics with oscillation mode. - Disabled save-states by default because of issues with back-testing. Enable them on demo/live trading. - Added the PIPS stop loss. Using this stop loss instead of equity-based allows to use many instances of the EA on different pairs on one account. - Major speed increase while back-testing in case of preset failure. - Added option to draw graphics before the first position is opened. - Added option to speed up math (by disabling line descriptions) while drawing GFX. - Added save-states. Now whenever you close the terminal and open it again, the EA will automatically resume trading from saved point. - Added equity protection if the funds are too low for current preset (override possible). - Added option to automatically adjust money management to protect part of the account. You will be able now invest 100%, 80%, 50%, 10% of the account and so on, just by selecting proper option from the list. - Added oscillation mode. You can now program Grid to oscillate around selected moving average. (i created few presets for different currency pairs). Option is to scale the grid when ADX is rising - to avoid catching positions too soon in case of strong trend. - Added built-in currency converter. If your account has different currency than USD, you may just input relation of your CUR/USD ratio and money management will be automatically adjusted. - Fixed the graphics displaying "take profit" improperly. Please look up Comments tab for presets for other currency pairs. - Added more options in Beta Automated Mode. - Fixed minor bugs in Beta Automated Mode. - Added control over how many transactions are going to be open when changed from "no action" to any mode. - Added a delay possible between closing and opening new transaction. - Added an option to enable price level to stops the script from starting new trades (yet current transaction remains opened). - Added currency stop loss (if draw-dawn exceeds that settings stop-loss kicks-in). 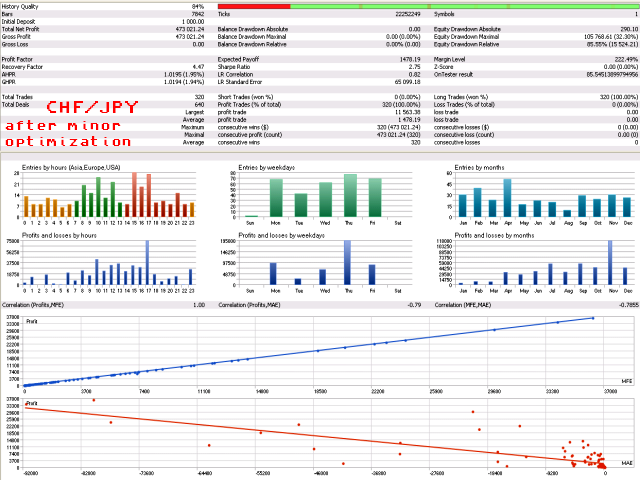 - Optimized the default GBP/JPY grid using new functions. 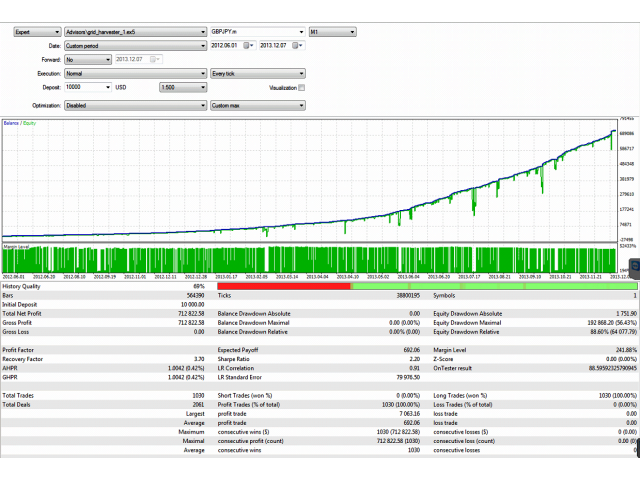 - Added automated trading in ALPHA mode - very little tests. no default settings. Please backtest, test and report your observations at Private Message. - Added equity based stop loss (set in percents). - Added an option to close the trades with current profit/loss without restarting the script. - Added better function description. - Simple manual mode - use "transaction mode" to start new transactions (set transaction type, accept and return to "No action" unless you want more than one transaction in a row). - Added Take Profit details after pointing with cursor (equity gains in currency and percent). - Added Stop Loss graphics representation. - Changed graphics drawing mode (now all graphics are left on the chart). - Fixed real-time level update after changing for example scale - now the changes will be instantly visible on the chart. - Added ATR scaled grid. Try this option out - it may be very useful to stretch the grid at violate market (you need to find right period and time-frame). ADX support on its way. - Added "fast mode" for non-graphical tests. - Added experimental usage of the ADX for scaling the grid. - Added description on the graphic lines - point mouse cursor over line to see equity drawdawn by currency, equity drawdawn and margin by percent of the balance. - Adjusted script to detect low-precision symbols (like 169.55 instead of 169.553). - Corrected start price mechanism. - Added graphics representation for present and past grid/take profit levels. Disable graphics to increase test speed. v1.25 was released too quickly. I have fixed some major bugs of that version and added first version of simple graphics. This version is better tested. - Added a bool variable with a possibility of automatically adjusting lot size and money management, if easy_lot size is too small for certain account (for example non-micro accounts). - Added option for the script to wait for certain start price. It helps to trade and makes testing and counting draw-dawns a little bit easier. - MM fixed - now relates to ballance, not equity. - Trailing stop in percents of the maximum profit (set to 75%, closes position if profit draws down below 75% of the maximum profit). - Also allows to set minimum basket size to use trailing stop (small basket trailing stop is not so beneficial as with bigger basket).